NETWORK FINALS: HELL’S KITCHEN gained 0.1 in final numbers. CABLE HIGHLIGHTS: A double helping of COLLEGE FOOTBALL put ESPN firmly on top of Friday cable, with the primetime game at 0.96 and the late game at 0.58, and Fox Sports 1’s primetime game was at 0.32. On HBO, REAL TIME WITH BILL MAHER rose 0.02 to 0.41, and ROOM 104 was steady at 0.10. A&E had 2 half-hours of LIVE PD at 0.34/0.32, compared to last week’s 0.37/0.33/0.32. MSNBC’s RACHEL MADDOW SHOW led cable news at 0.32/0.50/2.7M, above Fox News’s TUCKER CARLSON TONIGHT at 0.27/0.44/2.5M, and CNN’s ANDERSON COOPER 360 at 0.22/0.31/1.9M. WILLIAMS STREAM returned to Adult Swim at 0.32/0.29. 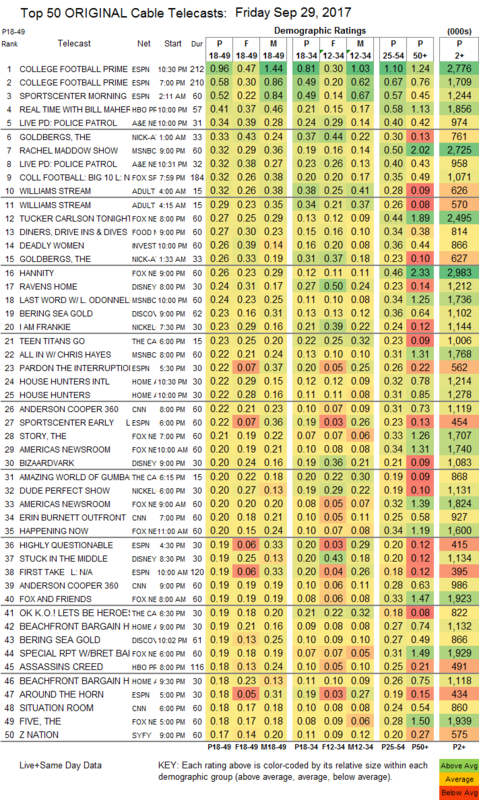 Food Network’s DINERS, DRIVE-INS & DIVES ticked down to 0.27. On ID, DEADLY WOMEN climbed 0.04 to 0.26. Disney Channel’s RAVENS HOME dropped 0.03 to 0.24. Discovery’s BERING SEA GOLD was at 0.23/0.19, compared to last week’s 0.28. Nickelodeon’s I AM FRANKIE ticked down from last Friday to 0.23. 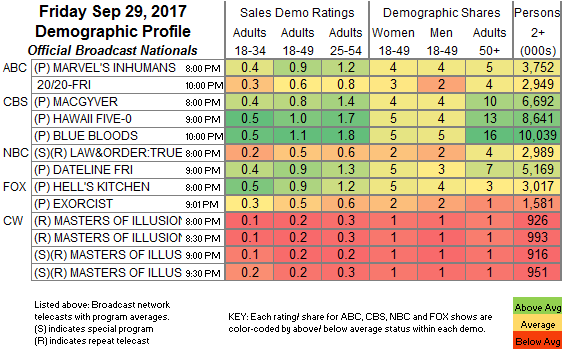 On HGTV, HOUSE HUNTERS and HOUSE HUNTERS INTL were both at 0.22, respectively steady and down 0.01. Syfy’s Z NATION returned at 0.17. On TLC, KINDRED SPIRITS was at 0.16, and EVIL THINGS ticked up to 0.11. We’s MILLION DOLLAR MATCHMAKER dropped 0.02 to 0.08, and LOVE BLOWS held at 0.07.